Are you Ready to get your Hexie on? There are so many methods of preparing, cutting and basting EPP shapes. Today I will make a flower using paper templates and a simple basting method. I have chosen fabrics that have an easy repeat to cut. Position the template over the design you wish to repeat. I have added registration markers on the template so I can position it accuracy for every cut. Remember to make the focal area in the centre of the hexagon. Trace around the inside and outside of the hexagon template and cut each one out. Make one for the centre and six for the petals. I have laid out my hexies and allocated 7 with pre-cut card templates. Lay the pre-cut card templates with in the guidelines of the fabric hexagon, fold down the top side and attach clip. Fold down the opposite side and attach another clip. This will hold the paper in place. We are now ready to baste our hexagon. A tip when threading cotton - always thread the needle when the cotton is still on the spool. This will guarantee that you threaded from the correct end of the thread. if you thread the needle from the spool end you will get piling and breakages. Fold down the fabric over the paper template to make a mitred corner. Start the basting by making a knot. This will secure your first stitch. Make a little tacking stitch in the first corner. From the tacking stitch fold down the next corner to form a mitre and then make another tacking stitch. Keep the stitching firm but not too tight or you will distort the shape. Some people like to go through all layers but I prefer to only sew through the fabric at the back. Keep folding the corners and making a tacking stitch until the hexagon is complete. I like to tack about 1/8 " down from the edge. Do one more small tacking stitch at the end to secure the thread. It should look like this from the back. And this from the front. This is an example of a piece that has been basted through all layers. It's easier through light weight papers but it is a preference rather than a necessity. Basting through one layer will hold your hexagon securely. Continue basting all 6 petals and single centre hexagon. Lay your flower out and start by taking one petal and the centre. There are many ways you can attach the petals to the centre. I prefer to sew all petals to the centre piece and then sew the petals to each other. Choose a thread that is quite fine - 50-60wt so the threads are buried and the joins lay flat. Don't make your thread piece too long or it will break and get tangled as you sew. Place the two hexagons right sides together. Make a knot at one end right where the two corners meet. I like to tie on and tie off ( knot ) each segment so if the cotton wears over the years and breaks, you only have to mend a small section. Begin making very small stitches by grabbing a few threads from each piece - whipstitch. Continue to the next corner and tie off by making a knot. Continue to add pieces and sew them to the centre. Continue sewing all the petals together remembering to always match the corner points and tie on and off. Now you have a pretty little flower for your garden. Jane is giving away one 1" Hexaculture pack. and 2.5" strips of gorgeous fabric from the Innocent Crush collection. Wow! There are a few tips in there that I've never heard before. I'm going to try them. Great tutorial. So ... do you leave the paper in or take it out when you finish sewing? Really enjoyed this tutorial! I'm putting it in a safe place so I can find it when I'm ready to do some hexies. Thank you! I'd never heard of the term registration markers but it makes total sense why you used them. Thanks for that great tip! Thanks so much for featuring this tutorial! I really want to try this! 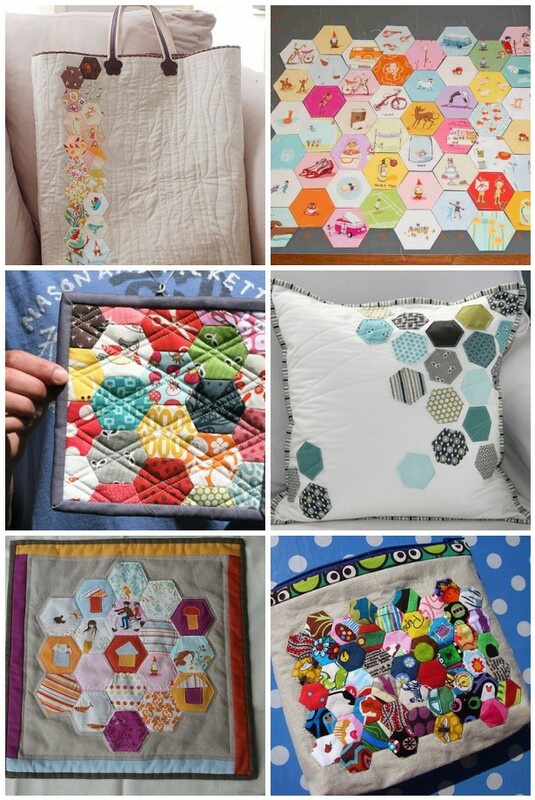 I am still a little hesitant about hexie's but since I am out of town so much this would make a great hand sewing project. I have admired hexies and now I feel more prepared to attempt. Thank you for saring your knowledge. Now to get some of those great tools. Great blog! Fab tutorials! and a very talented daughter!